Many chemicals used in the production of most mattresses have harmful consequences. During manufacture, some affect the health of factory workers, and others are discharged into eco-systems around the plant. Most discarded mattresses are dumped into landfills or incinerated, introducing whatever toxins they contain into the water and the air. While mattresses are in use, off-gassing chemicals known as VOCs affect sleepers’ health in known and unknown ways. Increasing evidence indicates that chemical flame retardants contribute to the development of brain disorders in children and increase risks of cancer, obesity and infertility. 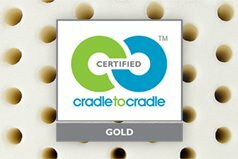 Savvy Rest has a recycling program for used mattresses collected when we deliver to customers of our Savvy Rest Natural Bedroom stores, and we encourage our national network of retail dealers to do the same. One of our corporate values is Health, and another is Sustainability: We acknowledge our support from this beautiful earth, and we are accountable for our impact. According to The International Sleep Products Association, 10.8 years is the average life of a mattress and box spring. There are 312 million people in the U.S. today. Together, these numbers mean that around 48 million mattresses and/or box springs are sent to landfills every year. These estimates do not include units from hotels or dormitories, which are replaced more frequently. The average Queen-sized mattress takes up 37.5 cubic feet of space, as does a matching box spring. An estimated 29 million mattresses and 19 million box springs discarded annually add up to over 18.5 million cubic yards of landfill space. (That’s like burying 13.5 Empire State Buildings every year!) What’s worse, mattresses and box springs cannot be mixed with other waste and soil to decompose, releasing space that extends the useful life of a landfill. Instead, they migrate to the bottom of the fill, where they take decades to break down. Adding to the environmental impact of discarded mattresses is chemical leaching from landfills and the copious energy used to manufacture new mattresses from new raw materials. The volume of pollution and waste is daunting, and a “not in my back yard” reflex in most areas means that it is increasingly difficult to zone land for landfills. One answer is to re-use mattress materials as much as possible. 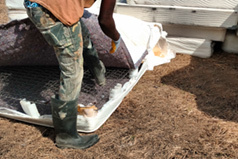 In a mattress recycling center the foam, fabric, and wood are separated, baled, and sold to manufacturers. Steel is recycled at a scrapyard or re-used to fabricate other steel products. At Savvy Rest Natural Bedroom stores, the used mattresses, box springs and foundations we collect are recycled for us by facilities that can reclaim about 95% of the materials. These recycling facilities are growing in number and the demand is huge. They create new, “green” jobs, and the materials they save are then used in creating new products--both significant economic benefits. That’s a win-win. Buying an organic mattress is good for you and the earth, but a sustainable outcome for your old mattress makes that purchase an even more positive one. An interview with Amy Bogan of Nine Lives Mattress Recycling, the destination of all the mattresses we recycle on the East Coast.